Shop online for organic food and formula, and environmentally friendly and natural bath and skin care products, diapers and wipes. 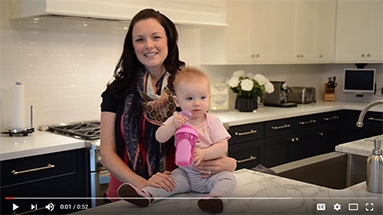 Everything you need to keep your baby healthy, clean and happy! With our 100% Satisfaction Guarantee, we save you the stress of grocery shopping giving you more time to do what matters most to you. Our everyday low price on environmentally friendly diapers and wipes from Seventh Generation and Earth's Best is not only good for you and your family but it's good for the earth. Take advantage of our free delivery and give yourself a break from driving to the grocery store. We'll bring it to you, it couldn't be easier. Say "Congratulations" with a SPUD Gift Certificate! SPUD gift certificates are available to spread the joy of healthy living, with deliveries made right to the door! Order online 24/7 for fresh, local and organic groceries or to replenish baby and home essentials. Organic food simply means food that was grown naturally without the use of harmful chemicals, fertilizers and pesticides. Organic foods are not GMO foods. For a food to be considered organic it cannot be genetically modified. With new babies it is important to consider limiting their exposure to harmful substances when their brains are developing at a rapid rate and when their organs are most likely to be sensitive to the exposure of these harmful substances. Small amounts of pesticide exposure can be dangerous for babies because of their smaller body mass. 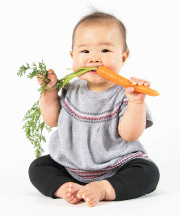 A baby can ingest more pesticides due to their body size because pound for pound babies consume more fruits and vegetables than adults. 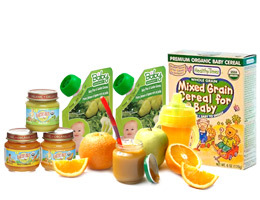 Look for baby foods that are certified organic and consider making homemade baby food using organic fruits and vegetables. Good nutrition will help build your babies immunity that will sustain and serve your child for the rest of their life.